This article analyses the passages in Mahabharata describing the world as known to Sanjaya an assistant of Kuru king Dhritarashtra. These passages are found at the beginning of Bhishma Parva considered to be the starting point of Jaya the work of Vyasa. Vyasa's Jaya subsequently grew into a work called Bharata and finally into Mahabharata. Vyasa mentions in Mahabharata that his work is about history, geography and other contemporary knowledge existed during his life time. This allow us to have a glimpse of the world view of people who lived during the period of Vyasa and Sanjaya. The article is titled 'Sanjaya's world' because the narration was described by Sanjaya. the narration is influenced by Sanjaya's world view. It is not clear if Vyasa knew anything more about the world than Sanjaya on what ever that is described by Sanjaya in this passages. Sanjaya was a Suta whose occupation included driving of chariots, attending to the king, providing information to the king on what ever subject he liked to know, composing historical poems about the heroic deeds of kings and warriors, entertaining the king by singing songs in praise of him etc. Creatures in this world are of two kinds, mobile and immobile. Mobile creatures are of three kinds according to their birth, viz, oviparous, viviparous, and those engendered by heat and damp. Of mobile creatures, the foremost are certainly those called viviparous. Of viviparous creatures the foremost are men and animals. Animals, of diverse forms, are of fourteen species. Seven have their abodes in the woods, and seven of these are domestic. Lions, tigers, boars, buffaloes, and elephants as also bears and apes, are, egarded as wild. Kine, goats, sheep, men, horses, mules, and asses, these seven amongst animals are reckoned as domestic by the learned. These fourteen, complete the tale of domestic and wild animals, mentioned in the Vedas, and on which the sacrifices rest. Of creatures that are domestic, men are foremost, while lions are the foremost of those that have their abode in the woods. All creatures support their life by living upon one another. Vegetables are said to be immobile, and they are of four species viz, trees, shrubs, creepers, creeping plants existing for only a year, and all stemless plants of the grass species Of mobile and immobile creatures, there are thus one less twenty; and as regards their universal constituents, there are five. Twenty-four in all, these are described as Gayatri Brahma as is well-known to all He who knows these truly to be the sacred Gayatri possessed of every virtue, is not liable to destruction in this world. Everything springeth from the earth and everything, when destroyed, mergeth into the Earth. The Earth is the stay and refuge of all creatures, and the Earth is eternal. The above narration is self-explanatory on the topic of what Sanjaya knew about the creatures of the world. The division of creatures into mobile and immobile and among the mobile as oviparous and viviparous and those engendered by heat and damp is remarkable. Fourteen animal species were recognized. Animals were divided into wild and domestic. Men was considered as an animal, a domestic animal. Four species of plants were recognized. Life forms were considered as a transformation of the Earth, that emerge from Earth and merge back into Earth. All things in the universe, in consequence of the presence in them of the five elements, have been said to be equal by the wise. These elements, are space, air, fire, water, and earth. Their respective attributes are sound, touch, vision, taste, and scent. Every one of these elements possesses in addition to what is especially its own the attribute or attributes of those coming before it. The earth, therefore, is the foremost of them all, possessing as it does the attributes of all the other four, besides what is specially its own, as said by Rishis acquainted with truth There are four attributes in water. Scent does not exist in it. Fire has three attributes viz, sound, touch, and vision. Sound and touch belong to air, while space has sound alone. These five attributes exist in this way in the five principal elements depending on which all creatures in the universe exist. Ancient Indians counted five elements, while the ancient Greeks had only four. The element space is the fifth element unknown to the Greeks. It is likely that the concept of elements came to ancient Greece from ancient India and they could not comprehend the fifth element viz. space. Hence the Greeks speculated and created fables about the Fifth Element, assuming it to be 'soul' or something strange and unknowable like soul. It is in ancient India we find the correct definition of the fifth element as 'space'. Quantum theory too agrees that empty space is made of probabilistic quantum particles that oscillates in and out of existence. The attribute of space viz. 'sound' at first glance seems to be wrong. But by sound what is meant is vibration or waves. We know that electromagnetic waves travel through space. They exist separately and independently when there is homogeneity in the universe. When, however, these do not exist in their natural state but with one another, then creatures spring into life, furnished with bodies. This is never otherwise. The elements are destroyed, in the order of the one succeeding, merging into the one that proceeds; and they spring also into existence, one arising from the one before it. All of these are immeasurable, their forms being Brahma itself. In the universe are seen creatures consisting of the five elements. Men endeavour to ascertain their proportions by exercising their reason. Those matters, however, that are inconceivable, should never be sought to be solved by reason. That which is above human nature is an indication of the inconceivable. The idea that life forms originate when the elements are not in equilibrium (homogeneity) is worth noting. This is very close to the principle of entropy and chaos, which states that the entropy of life-forms will be lesser than that of its surrounding medium and that when life is formed the equilibrium of the chemical composition of the medium in which it is forming, will be disturbed. Sanjaya also knew that the body of the life forms will return back to their elemental states into earth (solid), water (liquid), air, fire (energy) and space. Sanjaya also admits that there is a limit to what humans can know by the power of reasoning. These he leaves as 'inconceivable' Brahman. I will, describe to thee the island called Sudarsana. This island, is circular and of the form of a wheel. It is covered with rivers and other pieces of water and with mountains looking like masses of clouds, and with cities and many delightful provinces. It is also full of trees furnished with flowers and fruits, and with crops of diverse kinds and other wealth. And it is surrounded on all sides with the salt ocean. As a person can see his own face in a mirror, even so is the island called Sudarsana seen in the lunar disc. Two of its parts seem to be a peepul tree, while two others look like a large hare. It is surrounded on all sides with an assemblage of every kind of deciduous plants. Besides these portions, the rest is all water. Here by 'island' what is meant is 'continent'. A huge continent in the form of a wheel and surrounded by ocean is what some people in those time thought about the geography of the world. But subsequently this picture is compared with the continents visible on the moon shaped like a peepul-tree and a hare (rabbit). Sanjaya is referring to the dark plains on the moon visible to the naked eye like continents with shapes resembling a tree or a rabbit. 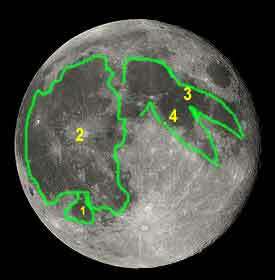 Some assumed that the continents on the moon actually were reflection of the continents of Earth. Some others considered those to be actual continents on the Moon. We can conclude that Sanjaya is referring to two school of thoughts regarding the shape of the continents of Earth. As per one school it resembled a huge wheel and was named Sudarsana. As per the other school, was shaped like a tree and a rabbit as seen on the moon. Subsequent narrations of Sanjaya reveals that he believed more on the second school of thought. Careful analysis of his narration reveals that the two patches (1 and 2) on moon together forms the peepul-tree-shape and two patches (3 and 4) together forms the head with two prominent ears of the rabbit-shape. The rest of the rabbit's body is same as the peepul-tree shape (1 and 2). Thus the peepul-tree shape (1,2) is part of the rabbit-shape (1,2,3,4). The island (continent) of Sudarsana can roughly correspond to the continent of Eurasia. The shape has some resemblance to a peepul-tree, but there is no part that comes close to a rabbit shape, though there are many parts in Eurasia that looks like the ears of a rabbit! 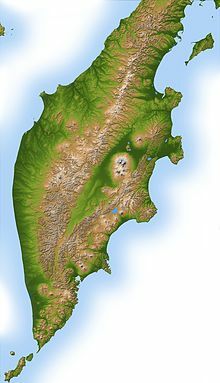 Examples are Kamchatka_Peninsula in Russia, the Scandinavian_Peninsula in Europe, the South-Indian Peninsula, Burma and Malaysia. After the brief description of the Dhritarashtra asked Sanjaya to narrate the regions part of the portion looking like a hare (which is also the peepul-tree, if we subtract the shape resembling the head of the hare with those large ears):- Tell us now of the dimension of the expanse of land that lies in the portion looking like a hare. Thou mayst then speak of the portion resembling peepul tree. Dhritarashtra seems to think that the peepul-tree region and the hare-region were two distinct regions with no overlaps, but Sanjaya's narration validates our assumption. Sanjaya never describes a region which is part of a separate peepul-tree shape. Here Himavat is same as the Himalayas. However there is difference in what ancient people considered as Himalayas. The name is sometimes applied to the whole of the mountains in western-Pakistan, Kashmir, Himachal-Pradesh, Uttarakhand, Nepal, Bhutan, Arunachal-Pradesh and the mountains in Burma (Myanmar). Thus it extended from eastern sea to the western sea. Sometimes the name is applied only to the mountains north of Indo-Gangatic plain which is close to the current definition of the Himalayas. Some other times, a portion of mountain ranges in what is now called the Himalayan range is referred with some other name and the name 'Himalaya' is applied to another portion. Usually the southern parts of the Higher-Himalayan-Ranges is mentioned as Himalaya mountains and the northern parts are given names like Hemakuta, Nishadha, Nila, Sweta, Sringavat, Gandhamadana or Meru. The southern most ranges (Sivalik_Hills) bordering the Gangatic plain were however mentioned as distinct from Himalayas and sometimes given the name Kalakuta. Small peaks of Himalays were often mentioned as Mandara mountain. The names like Hemakuta, Nishadha, Nila, Sweta and Sringivat are too generic in nature and can be applied to any mountain on the Himalayas to which the meaning of the name can be attributed. Hemakuta means the golden colored mountain. Some snow covered peaks in the Himalayas look golden colored when lit by morning or evening sun. Nishadha mountains means the low lying mountains. Nila mountain could mean black or dark colored mountain, a name that can be applied to any snow-less, dark, rocky mountain amidst snow covered white mountains. Nila also mean blue. Nila mountain can thus be given to a mountain where blue stones like lapis-lazuli are obtained. The Sweta mountain means the white colored mountain, usually due to the white snow covering them. Sringavat mountain means a mountain with plenty of peaks (Sringa). This leads to the possibility that all the six mountains mentioned here can be located in what is now called the Himalayan range spanning Kashmir, Himachal Pradesh, Uttarakhand, Southern Tibet, Nepal, Bhutan and Arunachal Pradesh. Another possibility is to look for mountain chains parallel to the Himalayan ranges and to the north of it. This leads us to mountain ranges like the Karakoram Ranges, the Hindu_Kush mountains] Pamir_Mountains, the Kunlun_Mountains, the Alay_Mountains, the Tian_Shan mountains, the Altai_Mountains. Pamir Mountains are a mountain range in Central Asia formed where the Himalayas, Tian Shan, Karakoram, Kunlun, and Hindu Kush ranges join to form a knot or junction. It is in the Badakshan province of Afganistan, north of Kashmir. It is also extended to Tajikistan and China. Mines of the precious blue stone, lapis lazuli (shown in the image, left) are found plenty in these mountains. Sar-e-Sang Mine, Jurm, Afghanistan located on the Pamir mountains is a major lapis lazuli mine since 4500 BC onwards till date. This was one of the ancient source of lapis lazuli during the Mahabharata-period (3000 BC). It was traded along the Kamboja-Dwaravati-trade route. This makes the Pamir mountains a candidate to be identified with Nila mountains. Kunlun mountains forms the northern edge of the Tibetan Plateau. Beyond it is a great depression known as Tarim basin. This is now a desert. But it was an inter continental ocean (or large lake) in the past. It is not clear if it existed as an ocean/ lake in 10,000 BC, in which case it is a good candidate for the milky ocean (Ksheera-Sagara) that witnessed the ocean churning event between the Devas and Asuras. Kunlun mountains is part of [wikipeidia:Taoist] mythology. As per Taoists (Daoshi), this mountain range was the paradise or the abode of the Devas (gods). It is mentioned as the abode of an ancient Chinese goddess (Hsi_Wang_Mu) who was known as the Queen Mother of the West and as the Golden Mother of the Shining Lake. She lived here with other gods and immortal-humans. Mahabharata mentions a women named Sandili of immense Yogic power dwelling in the same region, if Kunlun mountains can be identified with Sringivat mountains. Medicinal and magical healing herbs and mushrooms flourish in Kunlun. The name Tian shan means the celestial mountains or the mountain of the gods (Devas). This is another candidate for Sringivat or Sweta mountains. It is also known as the heaven mountains, the god mountains or the spirit mountains. Mbh.6.6:- The Two islands Naga-dwipa and Kasyapa-dwipa are the two ears of this region of the form of a hare. Among the parts in Eurasia that looks like the ears of a rabbit, the south-Indian peninsula, Burma and Malaysia comes close to the description of Naga Dwipa. The tribe of Nagas were spread in all these regions. Sage Kasyapa is associated with the Nagas (the snake-worshiping people). He is referred as the forefather of the Nagas and some times a person conversant with cure for snake-poison. The Kasyapa tribe was more or less the priest-class among the Nagas, like the Bhargavas of the Asura tribes and the Angirasas of the Deva tribe. Interestingly there are indigenous tribes in the Kamchatka_Peninsula in Russia named Koryaks and Kereks. A tribe named Kerakas are mentioned in Mahabharata. It is not clear if there is any connection with Kerakas of Mahabharata and the Kereks of Kamchatka. A migration from India along sea or land cannot be ruled out. In Scandinavian peninsula too we see Sami_people who speak a Finno-Ugric language. From Mahbharata we know a Naga tribe called the Uragas who migrated to the north west. 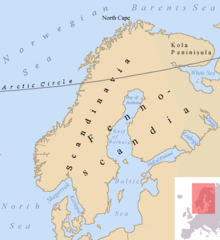 Probably they settled in Yugra in Russia and the moved further to settle in the Scandinavian Peninsula. Thus all of these regions shaped like a rabbit's ear was inhabited by tribes related to the Nagas at some period of time and thus can be termed as Naga Dwipa or as Kasyapa Dwipa (due to Naga-Kasyapa connection). The last verse in Mbh.6.6 describes the Maleya mountain. This mountain is same as Malaya mountains. This mountain is identified to be the southern portion of the Sahya mountains in Kerala-Tamilnadu boarder. It thus falls in the south-Indian peninsula, which looks like the long ear of a hare (rabbit). Hence Sanjaya seems to describe south-India here as part of Jamvudwipa that having its shape resembling a hare .It wasn't resembling a 'hare' but resembling the 'ear' of a hare. Interestingly the Malaysian peninsula (which also looks like the ear of a hare) derived its name Malaysia, probably from people who migrated from the Malaya mountains in south-India, through the maritime culture prevailed in south-India.